"Cold medicine you can eat"
Shungiku (literally, “Spring Chrysanthemum”) is also known as Garland Chrysanthemum and refers to the edible leaves of the species Chrysanthemum coronarium. Shungiku has a long culinary history in Japan, where it was first recorded in 17th century agricultural journals. Today shungiku is a common part of many Asian cuisines, including China, Hong Kong, Korea, Japan, and Vietnam. 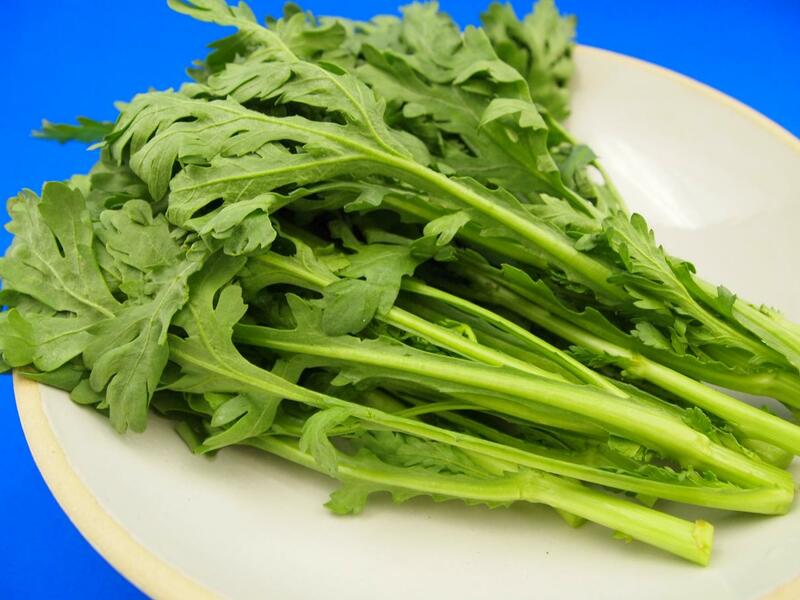 Shungiku is a representative cool weather green, rich in beta-carotene, vitamin B complex, vitamin C, iron, calcium, potassium, and dietary fiber. Particularly, shungiku contains more beta-carotene than spinach and other winter leafy greens. The beta-carotene in shungiku has an antioxidant action that helps control the function of free radicals and provides protection against cancer as well as having an anti-aging effect. The balance of nutrients in shungiku has been shown to be effective against arteriosclerosis and high blood pressure. It is also good for easing constipation, protecting against colds, and increasing the appetite. The distinct herb-like aroma of shungiku is produced by a combination of alpha-pinene (a compound also found in coniferous trees, rosemary, and eucalyptus oil) and benzaldehyde (the same compound found in bitter almonds). These two aromatic compounds together work on the autonomic nervous system (ANS) to promote the proper functioning of the stomach and intestines, resulting in better digestion and absorption of nutrients. It can also help stop excess mucus production and control coughing. Shungiku is more enjoyable and effective when used raw or very lightly cooked. Overcooking will destroy the aroma and result in a less satisfying texture. Think of it as somewhere halfway between a vegetable and a fresh herb. Chop it up and add to soups in the last few minutes (2 or 3 minutes). Blanch lightly and serve with a dressing. Shungiku also makes a good addition to omelettes, pasta sauces, and more.